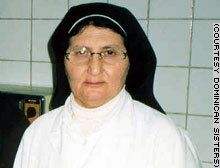 DETAILS: This feisty nun kept the doors of her Baghdad hospital open despite the threat of looting and bombing. (CNN) -- The maternity ward at St. Raphael's Hospital in central Baghdad is crammed with wailing newborns. The abundance of premature babies is a little-known consequence of war, explained Sister Maryanne Pierre, the hospital's director. "The fear caused many women to have premature births," she told Catholic news service ZENIT. "Three-hundred fifty babies were born in two weeks." The flood of pregnant women came along with the constant stream of sick and injured who sought treatment at the four-story hospital, one of the few to remain open in the Iraqi capital during the war. Sister Pierre, 58, a raspy-voiced Dominican nun, kept treating patients even as bombs fell around her and looters ransacked nearby buildings. "This is my job to stay here to help people," she said in an interview with CBS News. "Even during the first Gulf War we stayed. It's our duty to stay here for all the people." Her colleagues say Sister Pierre, who was born in Iraq and studied nursing in the United States, has kept the hospital open through every conflict over two decades. "What she's doing is tremendous," said Sister Beth Murphy, who visited the hospital in December. "In very difficult circumstances, she has remained incredibly dedicated to the people she serves." Friends say Sister Pierre, whose parents were Christian, became enamored with the life of a nun while she was a little girl attending a Baghdad school run by Dominican sisters, an order established in that city in 1873. It wasn't until she was 22 that she joined the convent, said the worldwide director of the Dominican nuns, Mother Fabiola Velasquez. After studying in Tours, France, and Fall River, Massachusetts, Sister Pierre returned to Baghdad to work at St. Raphael's. Mother Velasquez, who spoke to Sister Pierre recently via satellite phone, said the diminutive nun is concerned about the psychological welfare of Iraqis now that the bombing is over. "She's very saddened by all that has happened," Mother Velasquez said. "On one hand, freedom has been gained, but on the other, there are many people who have been scarred by the war." Despite not having enough beds or anesthesia to treat all of the patients, Sister Pierre is feeling more optimistic since she went into the streets and asked U.S. Marines to guard her hospital. Now they're on constant watch, which lets the nun concentrate on more important things. Back in the maternity ward, she stares at an incubator that holds a set of triplets -- a boy and two girls -- born just that morning. "The father he said, 'I named the girl Maryanne,'" Pierre told CBS News, pointing at one of the girls and grinning. "He said it's for me." CNN.com's Marnie Hunter contributed to this report.